Our 3DS Max 2009 Training DVD consists of over 16 hours of training and tutorials, covering everything you need to know to get started using all of 3DS Max's tools efficiently. Lessons are organized starting with beginning level topics, such as an introduction to the user interface, and also include training for the more advanced topics. 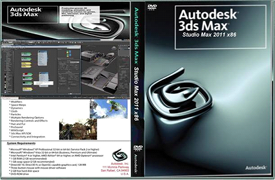 This training dvd set covers all the main features of 3D Studio Max, including the interface, modeling, modifiers, materials, maps, lights, cameras, animation, rendering and much more. Each section is covered in depth with many tutorials included for interaction with the user. This set also explains the many new features of version 2009. Whether you are a new user of the 3DS Max software, or you already have a basic knowledge of the program, our 3D Max 2009 training dvd curriculum will help you improve your skills. Whether you're a beginner looking or a full-fledged animator seeking creative new ways to catch everyone's attention, this training is for you.